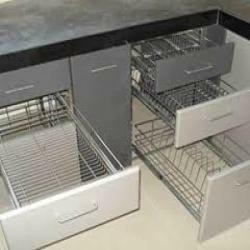 We are a reputed firm involved in manufacturing and supplying commendable range of Stainless Steel Kitchen Drawers in Pune. These rust-proof drawers find their extensive use in various areas including commercial kitchen and household kitchen household. With the firm commitment to quality, we are offering our clients with sustainable spectrum of Stainless Steel Kitchen Drawers. These drawers find their extensive use in various areas but mainly it is used in household to add grace to the kitchen and storing utensils and other things. The offered product-line is widely appreciated by the large number of clients due to its elegant design and seamless finish. 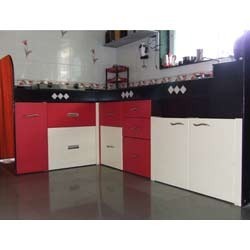 With an aim to stand tall on the expectations of patrons, we are offering a wide gamut of Modular Kitchen Drawers. 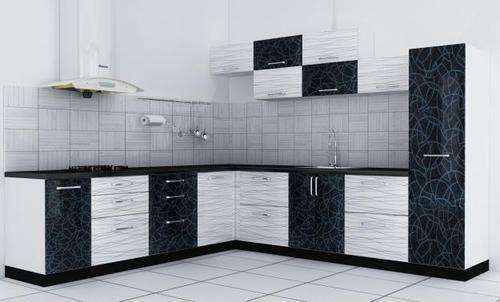 These quality-approved products have great strength and ability to add grace to the kitchen by its elegant look. Apart from this, these are available at the most market-leading price. With the constant support of our dexterous workforce, we are able to come up with a wide range of Designer Kitchen Drawers. These are widely demanded and appreciated by the large number of users due to its high-durability and elegant finished look. Apart from this, our patrons can avail these products at the most comprehensive range of price. 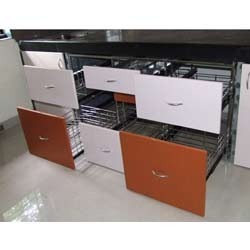 We are registered as a prominent manufacturer and supplier of a broad range of Steel Kitchen Drawers which are highly demanded by our clients all over the nation. Paying optimum attention to the quality, these products are manufactured by our professionals making use of superior quality stainless steel as well as other basic components. These trolleys are an excellent combination of both attractive looks as well as strength. Looking for “Stainless Steel Kitchen Drawers in Pune”?